Semi automatic volumetric liquid filling machine is precision built on sturdy welded MS frame completely enclose in stainless steel sheet and doors are provided to facilitate the servicing of machine. Working on volumetric principle, the Volumetric Bottle Liquid Filling Machine unit is made compact, versatile and enclosed in stainless steel elegantly matt finish body. Containers have to place manually below the filling nozzles at platform of machine, where motor operated syringes fill desire pre set volume in container. Bottle guide is provided for precisely match for centering of container below nozzles to avoid spillage of liquid on container. The dosing block with a hexagonal bolt fitted below syringes. This means fill size can be easily set. Number of head/Syringe 2 Nos. Semi Automatic with filling range from 5 ml to 1000 ml. 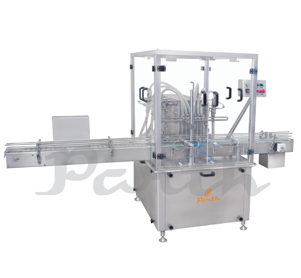 Volumetric Bottle Liquid Filling Machine to fill variety of liquid and can be used for various type of containers.